If you don’t want to do anything other than resizing pictures, most image editing programs are overkill. 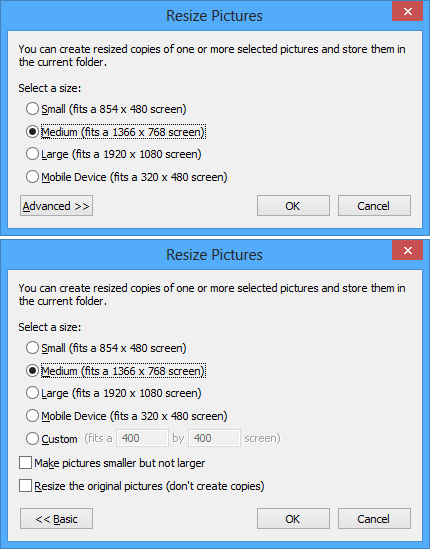 You can install a very small extension to Windows which can then resize photos for you – one at a time, or lots at once. Microsoft originally created an “Image Resizer Powertoy” for Windows XP, and a chap called Brice Lambson made an excellent job of updating it so that it works on the new 64-bit versions of Windows Vista, Windows , Windows 8, Windows 8.1 and Windows 10. It really is well worth installing – even if you have something like Photoshop or Xara Designer already. If you use Windows XP, download and install the Image Resizer Powertoy from Microsoft. 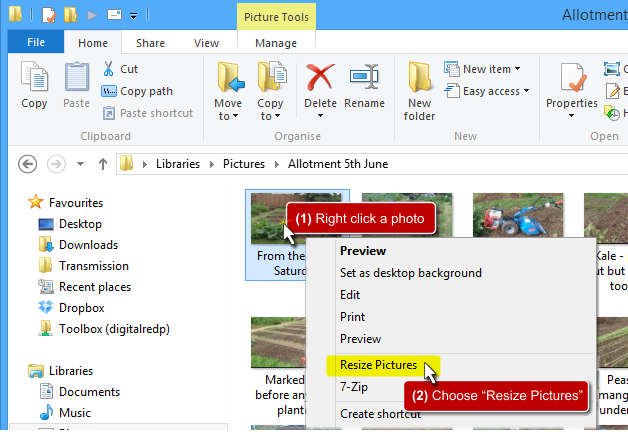 If you use Windows Vista, Windows 7, Windows 8, Windows 8.1 or Windows 10 download and install the ImageResizer tool. Both versions are quick to download and install, and are very safe. If you are resizing images to go onto a webpage, you should usually use the Custom size, and then type in the size of about 600 by 600 pixels – but how large your images are really depend on your webpage’s layout and what kind of picture you have. Once you select a size and press OK you’ll near-instantly see a copy of your photo image file with the same filename but with (Large) after the original name. If you don’t want to keep the original file, you can click Advanced and then tick Resize the original pictures (don’t create copies) – but be careful because there’s no going back if you make your original file too small. Note: The utility remembers your settings between uses, so I’d suggest not using the “Resize originals” option in case you forget and overwrite something important in the future.